(1 LED Curing Light Device. Compact, lightweight and well-balanced light guide rotates through 360°. Silent and hygienic, no fan. - Power Adapter: AC110-230V / 50-60Hz. 2)Small size,cordless and light weighted. Constant light intensity. The solidification effect is not affected by the consumption of remaining power. 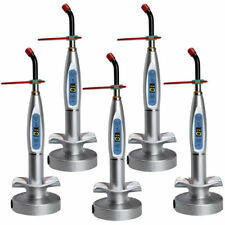 - Wireless dental curing light with charging. - LED curing light main unit: 1 each. - Optical fiber (Curing light guide): 1 each. Blue-ray illumination: 5W≥18. Wavelength: 380-515 nm. Gradually bright, shiny,bright-wide, the work of three models to choose. Temperature : 10℃ to 40℃. Blue-ray output wavelength:430-485nm. Composes of high power LED, qualified fiber rod. 1×LED curing light main unit. With blue high sensitive brightness, can cure the resin which the wavelength of 420 -480nm. Cordless design without no cable connect to the unit which could be used very conveniently. Blue-ray illumination: 5W≥18. Relative humidity: 30% to 75%. Wavelength: 380-515 nm. Gradually bright, shiny, bright-wide, the work of three models to choose. Temperature : 10 ℃ to 40 ℃. Composes of high power LED, qualified fiber rod. Wireless curing light with charging. 1 x LED curing light main unit. 1 x Optical fiber (Curing light guide). Use imported LED, blue high brightness sensitive. Low battery alert, it will alarm and light will flash when the electric is low. Constant light intensity. The solidification effect is not affected by the consumption of remaining power. - Wireless curing light with charging. - LED curing light main unit: 1 each. - Optical fiber (Curing light guide): 1 each. Light intensity:1000mw/CM2--2000mw/CM2. Wave length:450nm-455nm. Technical specifications. Constant light intensity. The solidification effect is not affected by the consumption of remaining power. - Wireless dental curing light with charging. - LED curing light main unit: 1 pc. - Optical fiber (Curing light guide): 1 pc. Constant light intensity. The solidification effect is not affected by the consumption of remaining power. - Wireless curing light with charging. - 5W big power LED. - LED curing light main unit: 1 each. For ( Demi ). Curing Light Cover Sleeves. Capacity: 2200mAh. Three Curing Mode P2: RAMP Mode – gradually increasing power then full power till ends. P3 ： PULSE Mode – 1 second interval with full power for 1.8 second. 4.1 Power Adapter Li-ion Battery. 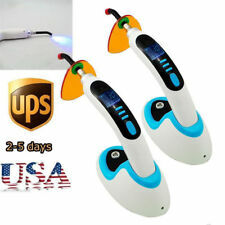 USA 100% Woodpecker Original LED B Dental Wireless Curing Light Lamp 1400mw. 100% WOODPECKER ORIGINAL. With English Manual. Composes of high power LED, qualified fiber rod. Blue-rayoutput wavelength:430-485nm. Powerdensity: 99-999mw/cm. Temperature: 10℃to 40℃. Graduallybright, shiny,bright-wide, the work of three models to choose. Stable output of light intensity,the solidification effect is not affected by the consumption of remaining power. Light output: 850mW/cm² -1000mW/cm². Net weight：230g. Easy-to-change battery. Power input: AC100V to 240V 50Hz/60Hz. 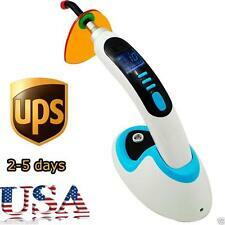 New Wireless Cordless LED Dental Curing Light Lamp 2000MW With Teeth Whitening Accelerator. 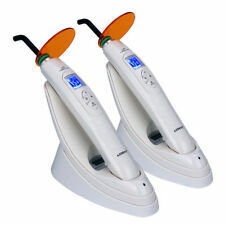 Introduction for LED Dental Curing Light Dual function: Curing ling, tooth whitening accelerator. Features for LED Dental Curing Light. 3 Solidification Working Mode 1 x Dental Curing Lamp. PlugSpecification: EU Plug. -Strong Mode;. -Flashing Mode;. -Gradually Mode;. Battery: 4.2V 1400mAh lithium-ion battery. -Dormant Function to Save Battery. 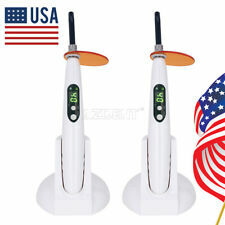 New Dental 5W Wireless Cordless LED Curing Light Lamp USA Free. Imported high power LED, 5W. Working mode: Strong mode only. Wireless and corded are compatible in one. Light intensity: ≥1200mw/cm2. Light Intensity. Constant light intensity.The solidification effect is not affected by the consumption of remaining power. Solidification Effect:5s/3mm. - 5W big power LED. Light Intensity: 5W≥1200mw/c㎡. - With blue high sensitive brightness, can cure the resin which the wavelength of 420-480nm. 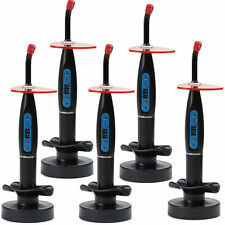 Used to test the curing power of dental curing light etc. Using a light guide, center the light source over the detector window read the useful curing power in mw/c㎡. Light Intensity: > 2300mW / cm²;. Turn the light curing lamp on and off, press the button briefly. Working mode selection, by pressing the button for 2 seconds to release to switch the working mode. Light hood: Woodpecker light hood is made of selected quality materials, rejecting Blue-ray injury. One Sec for Curing: Cure 2mm resin in 1 Second, with maximum light intensity above 2300mw/cmÂ². Standard mode: 1000-1200 mw cmÂ², is suitable for general curing. Turn the light curing lamp on and off, press the button briefly. Working mode selection, by pressing the button for 2 seconds to release to switch the working mode. Light Intensity: > 2300mW / cm²;. Simple, compact design for easy use. Over 100,000,000 served. MANUFACTURERS WARRANTY MAY NOT APPLY. ALL TRADEMARKS ARE THE PROPERTY OF THE RESPECTIVE OWNER. Ideal for solidifying and reinforcing resin materials to achieve effective dental restoration. Light Intensity: 2000mw / cm². 1 x LED Curing Light. 1 x Power Adaptor. Built-in LED, soft and mild light, does no harm to your eyes. Dual function: Curing ling, tooth whitening accelerator. Technical Specifications for LED Dental Curing Light Relative humidity: 10% to 75%. Composes of high power LED, qualified fiber rod. Gradually bright, shiny, bright-wide, the work of three models to choose.